Rittenhouse Archives is proud to present the all-new card series for 007, The "Quotable" James Bond. This groundbreaking set will feature 200 of the most memorable quips, quotes and one-liners that have become synonymous with the world's most famous super-spy. In addition, each box of cards will be guaranteed to contain at least 2 hand-signed autograph cards. 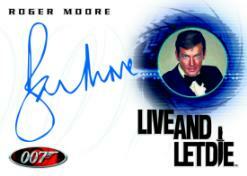 Roger Moore headlines the list of signers for this new series, which will be released November 17. Other autograph card signers will include some of the most memorable Bond women including Carey Lowell ("Licence To Kill"), Sophie Marceau ("The World Is Not Enough"), Michelle Yeoh ("Tomorrow Never Dies"), Martine Beswick ("Thunderball"), Serena Scott Thomas ("GoldenEye") and Mollie Peters ("Thunderball")! Each box of The "Quotable" James Bond will contain 40 packs with a suggested retail price of $2.10 per pack and $84.00 per box. Each pack will contain 5 cards. The 100-card base set will feature the 200 quotes, with 2 quotes per card. Fans and collectors will also be to store their collections in a custom designed collector's album, which will retail for $39.99, and contain an exclusive costume card of Julian Glover as Aris Kristatos in "For Your Eyes Only," plus an exclusive promo card. More details on The "Quotable" James Bond trading cards are available at www.scifihobby.com. Rittenhouse Archives, Ltd. is a leading producer of science fiction and fantasy based trading cards and related collectables. Its many licenses include Star Trek, James Bond, Xena: Warrior Princess, Stargate SG-1, Farscape, Twilight Zone, Six Million Dollar Man, Lost In Space, Battlestar Galactica and Conan.